Although I have recently started practicing it, I’m no expert in the paleo diet/lifestyle. There are links at the bottom of the post to people who are respected authorities and/or founders in the field. However, here’s a basic overview based on what I have hunted and gathered (pun intended) through my research. The paleolithic diet/lifestyle (also known as paleo diet, caveman diet, Stone Age diet and hunter-gatherer diet), is a way of eating and living based on the idea that we are healthier—both mentally and physically—when we eat and act as hunter-gatherer ancestors did. The theory is that the development of agriculture and grain-based diets has created all of the health problems of modern society. These “modern” degenerative diseases include obesity, cancer, diabetes, heart disease, Parkinson’s, Alzheimer’s, depression, and infertility—to name a few. Dietary changes are key to the paleo diet, and the single biggest no-no is anything that would fall into the grain category. Why? The theory goes that the sugar-binding proteins in grains get into your system, stick to your intestinal wall, and prevent the absorption of nutrients in the food you eat. According to practitioners, the couple of thousand years that agricultural society has been around is inconsiderable in evolutionary terms. Our stomachs have not yet figured out how to handle the new foods properly in that time. By contrast, humankind has had millions of years to adapt to eating paleo foods. Other categories of foods besides grains are excluded too, including: legumes, dairy products, potatoes, refined salt, refined sugar, soy, and processed (vegetable) oils. Generally, these foods are left out because they either negatively affect your metabolism or cause systemic inflammation or both. So what can you eat? “Real” foods, including meat, fish, eggs, vegetables, fruit, naturally-occurring healthy oils, nuts, and seeds. 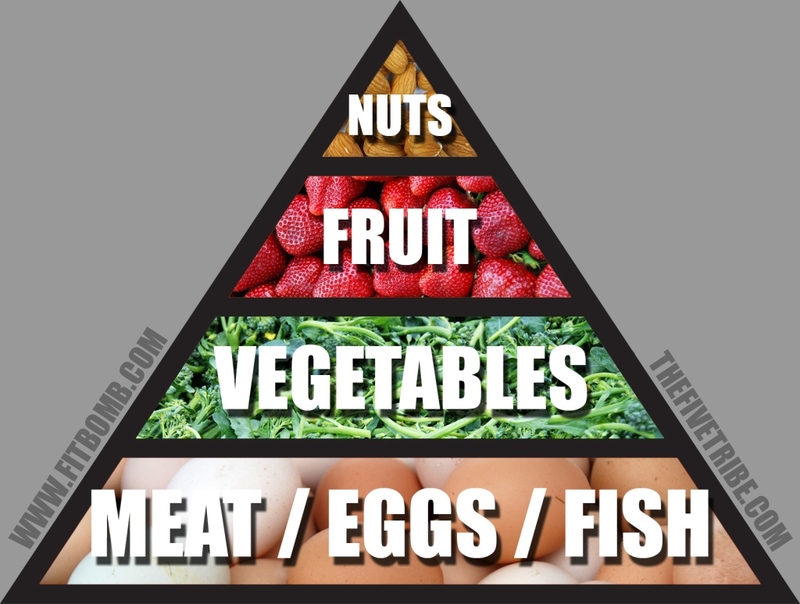 Here’s a food pyramid of all the yummy food you can eat on the paleo diet. [revised] Here is an alternative food pyramid with meat at the base. As you can see, there is no definitive agreement about percentages of what you can eat. What everyone agrees on, however, is no grain and no processed fats. In other words: whole-fat bacon, yes; whole wheat bread, no; coconut oil, yes; canola oil, no; avocado, yes; potatoes, no; grilled shrimp, yes; popcorn shrimp, no. You get the idea. It’s quite a mind shift. The ideal paleo meal is a palm-sized portion of protein surrounded by leafy and non-starchy vegetables with water as a drink. And, yes, that means that men get to eat more protein because they have bigger palms. However, paleo doesn’t begin and end with food. Paleo is more than simply a nutritional specification. It’s a lifestyle that includes engaging in plenty of vigorous, intense exercise, getting lots of sleep, reducing stress, and following your natural circadian rhythms. Here’s an infographic about the history and philosophy of the lifestyle. It makes sense to me. It’s also exactly the way I like to eat anyway. And I’ve lost 3 kg in the past two months without really even trying and without feeling deprived. I feel better, and I am sleeping better, so I think there may be something to it. For more information, see some of the links below. Opinions may vary on exact specifications of the ideal diet—particularly whether dairy and/or soy are acceptable. One Response to What is paleo?